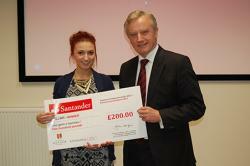 Undergraduate winner Catrin Hicks from the School of Education received her prize from the Vice-chancellor, Professor John G. Hughes.Theirs were among eleven business ideas ‘pitched’ to a panel of judges recently. Having been tasked by the B-Enterprising team in the University’s Careers & Employability Service to come up with an innovative business idea, the student teams and individuals presented a wide range of new products and services that they had researched and developed. 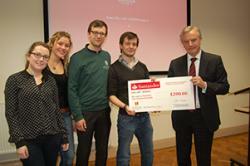 The judges awarded top prizes of £200 to the best undergraduate and postgraduate students and £50 to two second places. In announcing the winners, Vice Chancellor Professor John G. Hughes said that the judges had been impressed by the quality of the projects as well as the huge amount of work done by all the competing students. Announcing Catrin Hicks from Blaenau Ffestiniog as the undergraduate winner, the Vice-Chancellor noted her excellent presentation, and how the judges had been impressed by the huge amount of background research that had gone into developing her new product. Runner-up in the undergraduate category was Daniel Moore of Penmaenmawr. Product Design student Catrin Hicks developed a new false eyelash applicator. Catrin had identified that many consumers find difficulty in applying false eyelashes, a product which has major commercial opportunities, but also potential health risks involved in poor application. She has developed a unique applicator device to resolve this problem. Jamie Muir, James Gudgeon, Maria O'Reilly and Theresa Schween from the Schools of Psychology and Business received their Prize from Professor John G. Hughes. Team members Declan McClelland, Ben Haines and Emma-Louise Jones were not present. A team made up of Business and Psychology students won the post-graduate prize of £200 for their franchise concept to market local real ales to a young student market. Runners up were postgraduate Business and Law students Katarzyna Kawa and Mehedi Rahim with a new targeted legal service and legal firm called R & K Legal. Team members Jamie Muir, James Gudgeon, Maria O'Reilly and Theresa Schween (pictured) and Declan McClelland, Ben Haines and Emma-Louise Jones have developed a franchise idea to work with local breweries remarketing their ales under a new brand aimed at attracting a younger student market to a product traditionally marketed at the older male. The judging panel comprised Professor John G. Hughes, Vice-Chancellor; Dr Andy Goodman, Design Director of Pontio and Chris Walker, Director of People Systems International.